Accenture (No. 14 on the DiversityInc Top 50 Companies for Diversity list) follows an open and transparent policy and communication in regard to diversity and inclusion, as both are fundamental to its culture and core values. Ellyn Shook, Accenture’s chief leadership and human resources officer, said the global company, which has a U.S. workforce that is more than 50 percent ethnically diverse, wants to ensure employees feel like they belong. “We have really been trying to take a step in our journey around inclusion and diversity to really explore the sense of belonging our people feel,” Shook told DiversityInc on Friday. In order to answer that question, Shook, who is responsible for helping 411,000 employees succeed both professionally and personally, said Accenture decided to create an internal video that profoundly explored the question of inclusiveness. But, in the process of creating the video, “Inclusion Starts With I,” it was discovered that “not all of our people are experiencing a sense of belonging,” she said. In the video, a group of Accenture people demonstrates that bias can appear in both expected and unexpected ways. At the beginning, employees hold a poster board with a message detailing an experience with bias, but as the video progresses they provide messages on how each of us has the power to make a difference. “What the video really intended to do was to give employees their own voice in sharing their feelings,” Shook said. 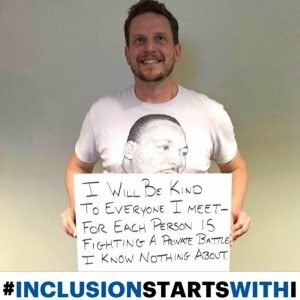 “Inclusion Starts With I” was shown for the first time a month ago to about 600 of the company’s next generation leaders during an Accenture Leadership Development program. “We showed it to them altogether, and the emotion was visceral and overwhelming in the room,” Shook said. Following the impactful responses from Accenture’s up and coming managing directors, Shook said she actually shared the video with a group of fellow HR executives at a recent summit. “The reaction from that group was overwhelming,” she said. “Many of them wanted to share it with their CEOs. They asked how we created it, and could I help them create one for their company. Accenture then made the decision to share the video publicly. Accenture Senior Managing Director Nate Boaz. “We actually believe that this is not just a moment, but really the beginning of a movement within Accenture, but also more broadly in the world,” Shook said. Accenture is teaming with Thrive Global to create workshops for its employees to explore thoughts and feelings regarding a sense of belonging. “We showed the video yesterday to 700 managing directors,” Shook said. “And at the end of the video, we asked each of the managing directors to make a commitment to act. One of our strong beliefs here at Accenture is it’s not just about what we say, but it’s about what we do. Accenture Chief Executive for North America Julie Sweet is a steering committee member of CEO Action for Diversity & Inclusion, the largest CEO-driven business commitment to advance diversity and inclusion in the workplace. The video will be included in Accenture’s best practices. DiversityInc CEO Luke Visconti has also signed on the initiative, which launched earlier this month. Shook, who has a track record of being a strong advocate for inclusion and diversity, said the benefits of inclusion are critical at Accenture. “Our people are everything because we must be innovative to bring differentiated solutions to our clients,” she said. “So having an inclusive culture where people really feel as though they belong allows us to be smarter and more innovative. And that’s a business issue at Accenture. Overall, that is an enormous benefit. “I think we are on to something extraordinarily special,” she said.